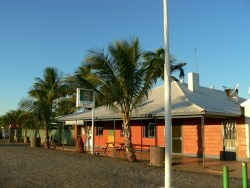 Today Wauchope Hotel offers great food, icy cold beer, refreshments, comfortable cabins and a caravan park for travellers who want to experience the hospitality for which the outback is famous. Wauchope Hotel is also the closest accommodation to the Devils Marbles. Have a chin wag with the locals, you’ll meet more than your fair share of characters, and leave with some colourful tales. The camping sites are on grassed areas, with good drinking water and clean amenities. All rooms are air conditioned and with a fridge.